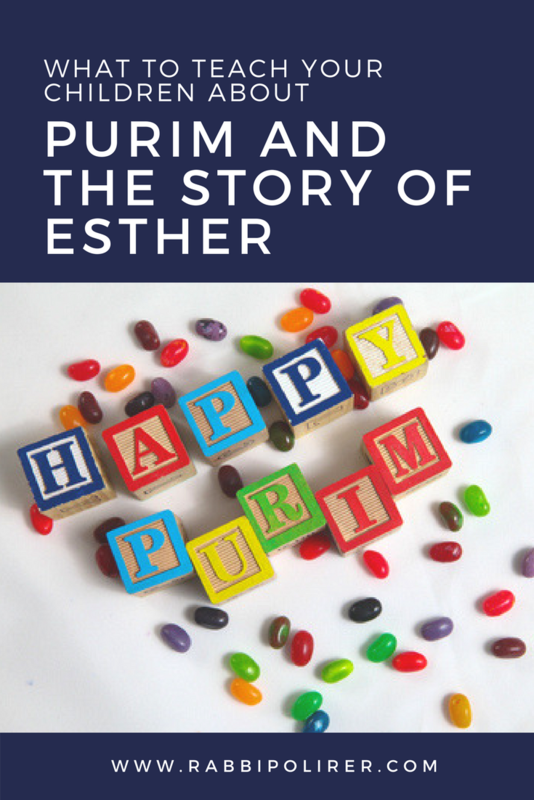 Regarded as one of the more joyous and festive holidays on the Jewish calendar, Purim is the celebration of the Jews’ salvation from annihilation in Ancient Persia and of the bravery shown by Esther in the face of antisemitism. Celebrated on the 14th day of the Jewish month of Adar, this year Purim is celebrated February 28th. 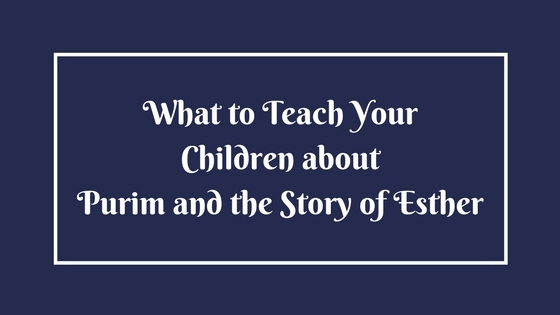 Purim and the story of Esther come from the Scroll of Esther , the last of the Five Scrolls that make up Ketuvim (the third and final section of the Hebrew Bible). Unlike the Torah and the books of Prophets, the writings found in Ketuvim are considered to be works of literary wisdoms rather than the word of God. The writings are focused on the Jewish people and their commitment to God and their faith despite doubt or fear when faced with hardship and suffering. The story of Esther is set in the Persian Empire, where the Jews had been living in exile. Esther is a beautiful, young Jewish girl being raised by her uncle, Mordechai, at the time when King Ahasaurus decides to take Esther as one of his queens and moves her into his harem. Concealing her religion from the King, Esther’s beauty and kindness soon make her the King’s favorite Queen. Esther’s cousin Mordechai, who works at the palace gate, routinely checks on his young niece. One night while working at the palace gate, Mordechai overhears a plot to assassinate King Ahasaurus. Mordechai rushes to Esther to inform her of the assassination plot so she can alert the King. Queen Esther goes to King Ahasaurus with what Mordechai heard and the assassination is prevented. The King and his people celebrate the thwarted assassination attempt with a lavish feast, during which the King records the occasion in his Book of Records. Despite the celebration, Mordechai, the man responsible for discovering the assassination plot, goes unrecognized. Unconcerned about receiving recognition, Mordechai continues to check on his niece daily. During one of his visits, he unintentionally sparks a power struggle with Haman, the King’s most trusted adviser and an anti-Semite. Haman, a hedonistic and power hungry council to the King, orders Mordechai to bow down to him. Mordechai refuses to bow to Haman, citing that as a Jew he would only bow down to the God of Israel. Angered by Mordechai’s lack of respect, Haman decides to seek revenge on Mordechai and the Jewish People by convincing the King to exterminate the Jews. Learning of the King’s proclamation to kill the Jews, Mordechai rushes again to Queen Esther begging her to go to the King and plead with him to spare the lives of his people. Forbidden from approaching the King without a summons, Queen Esther feared she might be put to death if she were to go before the King, but Esther still agreed. Queen Esther fasted for three days to show God that she would willingly sacrifice in exchange for the inner strength necessary to convince the King to not annihilate the Jews. After the three days of fasting, Queen Esther approached the King to invite him to a lavish banquet. Not only did the King openly welcome Esther when she approached him un-summoned, he eagerly accepted her invitation. After the banquet meal had ended, the King asked Esther if she had a request. Queen Esther told the King she had only one request, that the King attend a banquet the following evening. At the end of the second banquet, the King again asked Esther if she had a request. 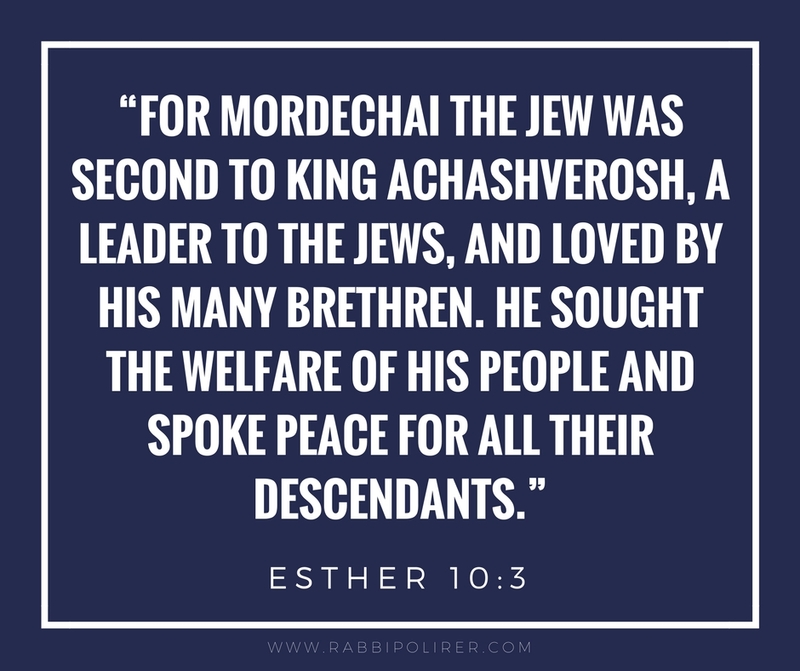 This time, Esther revealed to the King that she and Mordechai, the man responsible for saving the King’s life, were Jews. Esther begged the King not to follow through on Haman’s plan to eliminate the Jewish People. Moved by the continuous kindness of his Queen and the good acts of her uncle, Mordechai, King Ahasaurus realized that he was inflicting unfair treatment on a good people and reversed his order to execute the Jewish people. In turn, King Ahasaurus had Haman put to death for his injustices against the Jews. Today we commemorate Queen Esther’s bravery and kindness with the joyous celebration of Purim. To symbolize the unity of the individuals that are the Jewish people, we gather together to hear the public reading of the Scroll of Esther. Collectively stomping our feet when Haman’s name in mentioned and cheering on Esther and Mordechai. If you do not currently belong to a congregation, you can still read the story of Purim aloud to your children and cheer on the story’s heroes at home. Interested in finding a congregation or religious community? Contact Rabbi Polirer for guidance in finding the right religious organization for you. On Purim, we are reminded of the importance of speaking up in the face of evil even if you are not the person directly affected – a theme scene through the Jewish faith and culture from ancient times to present. And so on Purim, we place an extra emphasis on caring for those less fortunate. Just as Mordechai did not seek public recognition for discovering the plot to assassinate the King in time to save the King’s life, it is considered the biggest Mitzvah of all to give without recognition or expectation of a return favor. On Purim, we honor this tradition of giving anonymously by sending gift of food to our friends and family by way of a third party. To commemorate the defeat of Haman and celebrate Esther and Mordechai’s victory for the Jewish people, many Jewish families hold their own version of a banquet. Most commonly associated with the celebration of Purim is a type of cookie called Hamantaschen – a triangular cookie filled with jelly to represent the tri-pointed hat worn by Haman. 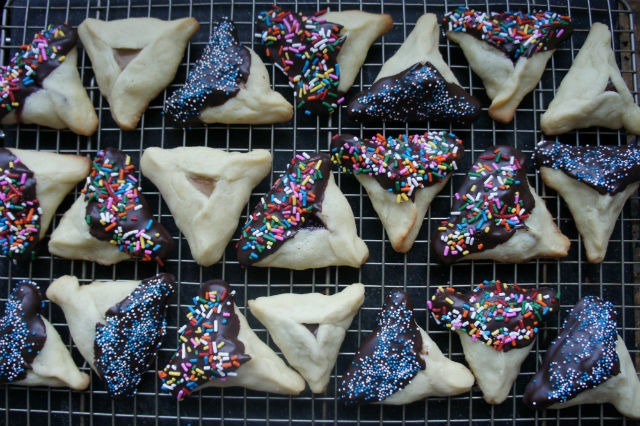 Click Here for the Chocolate and Sprinkles Dipped Hamantaschen Recipe for Purim from My Jewish Learning.